​In order to better protect the population, new research programs have been launched since the Fukushima accident. Some have already enabled the phenomena related to a serious accident to be better understood and the modelling of the consequences for the environment to be improved. The Fukushima accident has shown the vulnerability of nuclear facilities in the event of extreme and multiple natural aggressions. It confirms the interest of researching severe reactor accidents and has highlighted the importance that should be given to those that could occur in spent fuel storage pools. However, the events that unfolded in Japan did not lead to the identification of new research topics. They led to the modification of the priority and the content of some already planned programs. These choices were the subject of international discussions which IRSN has widely contributed to. France is however one of the few countries where these policies were supported by the government through the calls for projects by the National Research Agency (ANR). The ANR projects coordinated by IRSN, or to which the Institute contributes, focus on the various phenomena involved in reactor core meltdown accidents. The ICE (Corium-Water Interaction) and the MITHYGENE (hydrogen mitigation) programmes focus on phenomena that could affect the watertightness of the reactor containment, namely steam explosions for ICE or hydrogen explosions for MITHYGENE.A major research line to reduce the consequences of an accident is the control of radioactive element releases, including iodine and ruthenium. The focus is now on the study of their retention by more effective filtration means, especially for volatile species. This is the purpose of the MIRE (for release mitigation) programme. This work will enrich ASTEC, IRSN's simulation software for serious accidents. The DISCOMS (DIstributed Sensing for COrium Monitoring and Safety) programme focuses on the development and qualification of measurement means for locating the corium during a core meltdownaccident. IRSN contributes to the project with complex radiation calculations.The DENOPI (accidental dewatering of nuclear fuel storage pools) and PERFROI (study of the loss of cooling) programmes study the behaviour of the fuel in two accident situations. IRSN contributes to the SINAPS project (Earthquakes & Nuclear Facilities: Ensuring and Sustaining Safety) led by the CEA, which relates to the study of earthquakes from seismic hazards to the behaviour of structures and equipment.IRSN also leads two actions of the AGORAS programme (Improvement of the Governance of Organisations and of the Networks of Actors for Nuclear Safety) coordinated by the Ecole des Mines de Nantes. The first action focuses on the design decisions concerning serious accidents and natural aggressions before the Fukushima accident. The second action focuses on how an accident, and in particular that of Fukushima, transforms the production and knowledge mobilisation processes. Other research projects are conducted by IRSN. PROGRES (progression and coolability of the corium, stabilisation of a serious accident) studies the cooling of a bed of debris following a core meltdown. To do this, tests reproducing an accident are made in the new PEARL experimental facility. With regard to the key issue of organisational and human factors, IRSN published a first report in 2015 ("A Human and Organizational Factors Perspective on the Fukushima Nuclear Accident"), which is the basis for an analysis of the risk management and the crisis management. Furthermore, IRSN contributes to the work of the RESOH board (research on human organisation safety), of which one of the main research topics is sub-contracting. IRSN has strengthened its collaborations in Japan with the NRA (Nuclear Regulatory Authority) and the JAEA (Japan Atomic Energy Agency), and also contributes to the work of the Committee on the Safety of Nuclear Facilities (CSNI) and the Agency for Nuclear Energy (OECD / NEA). Accident management. IRSN has contributed to three OECD / NEA reports on improved venting and filtration systems for containments, the comparison of fast calculation codes for releases to environment, and accidents involving the loss of cooling of spent fuel storage pools. The Institute also participated in the CSNI report on the risks associated with hydrogen and its seminar on human performance under extreme conditions and the conditions of a resilient organisation. Finally, IRSN leads the experimental programme STEM regarding the long-term behaviour of irradiated iodine in the containment and ruthenium in the primary circuit of a reactor.External aggressions. IRSN participates in the OECD / NEA work group on external events of natural origin. The first work undertaken by the group relates to flooding.Electrical Systems. The ROBELSYS project (ROBustness of ELectrical SYStems of NPPs in Light of the Fukushima Accident) identified the need for research on the possibilities of connection to closer electrical sources and the protection measures for electrical distribution systems.Understanding the Fukushima accident and dismantling. The BSAF project (Benchmark Study of the Accident at the Fukushima Daiichi Nuclear Power Plant) relates to the calculation of reactor accident scenarios, within the context of the SAREF program (Safety Research Opportunities Post-Fukushima) aimed at solidifying knowledge upstream of the dismantling of the Fukushima reactors, IRSN is interested in the deterioration of the core of reactors in tanks. The PASSAM project (Passive and Active Systems on Severe Accident source term Mitigation) relates to the improvement of venting and filtration systems for fission products that may be released into the environment in the event of a core meltdown accident.The CESAM project (Code for European Severe Accident Management) focuses on improving some ASTEC software models directly related to the Fukushima accident. Version 2.1 of the code was delivered in early 2015 and the project should be completed in 2016.The ASAMPSA_E project will be completed in 2016 with the publication of good practice guidelines and recommendations for treating various extreme events and their combination in probabilistic safety studies. This project gathers 28 organisations from 18 European countries.The IVMR project (In vessel melt retention), launched in 2015 by 23 safety organisations, research institutes and industries, is aimed at developing the knowledge and tools to assess the effectiveness of corium stabilisation and retention in the reactor tank during a core meltdown accident. It should also provide technical elements for optimising the design of new reactors. Download "Research on nuclear safety carried out by the IRSN in the wake of the Fukushima accident" (PDF, 146 K0) Read in Aktis n°11 "Research on nuclear reactor accidents, 5 years after Fukushima"
​View of reactors 1, 2, 3 and 4 covered by a temporary enclosure at the Fukushima Daiichi site. © Guillaume Bression/Fabien Recoquillé/IRSN. The Fukushima accident has shown the responsiveness and relevance of the tools developed by the Institute to assess the air and sea contamination in the wake of an accident (IRSN was the first to publish contamination maps). However, areas for improvement have also been identified. A new model was developed in addition, to assess releases from simplified data. Collaborations are on-going with Japan to take into account all of the weather data in the assessment of depositions (fog and snow) and test various models of dragging by rain. An operational sea model also remains to be developed: this is the subject of the STERNE project. Furthermore, to adjust the iodine intake modes for an accident with multiple releases, the PRIODAC programme is supported by the ANR. Finally, the complexity of the decisions to be made, and the uncertainty about the thresholds for which an evacuation of the contaminated territories is necessary for public health, reinforce the need to better understand the effects of chronic exposure to very low doses of radiation. Read in Aktis n°4 "Using dose rate to characterize accident releases"Read "Lessons from Fukushima in France"
Beyond the emergency, it is necessary to manage the contaminated territories and the impact they can have on long-term health. 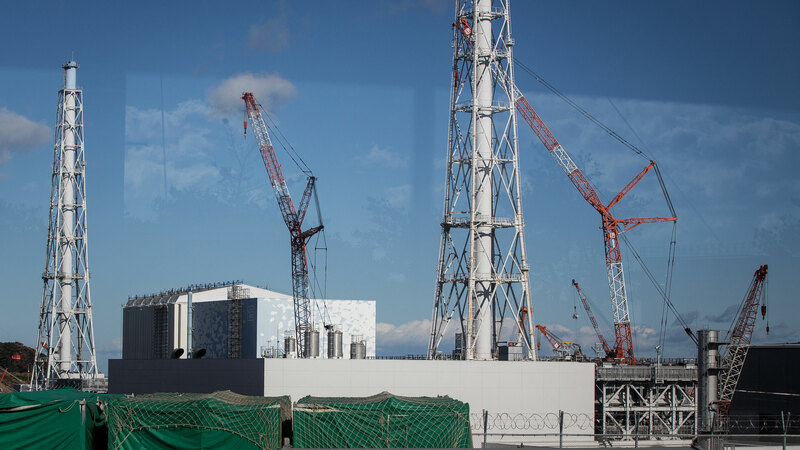 In Fukushima, unlike Chernobyl, research programmes were launched shortly after the accident in cooperation with the Japanese. The forest ecosystem. These research programs are aimed at improving the capacity of operational models to predict the evolution of the contamination and dose rates in the medium and long term. Read in Aktis n°11 "Better modelling forest contamination to support long-term management"Radionuclide transfers to streams and rivers down to the sea (including erosion and sediment) and the transfer of radionuclides in sediments and sea organisms. Models enable decisions to be made regarding consumption bans during the crisis. However, there are none accurate enough to predict the evolution of contamination in the medium and long term. In order to build this model, Mokrane Belharet conducted a thesis at IRSN regarding the transfer of caesium in the bodies of some sea fish. 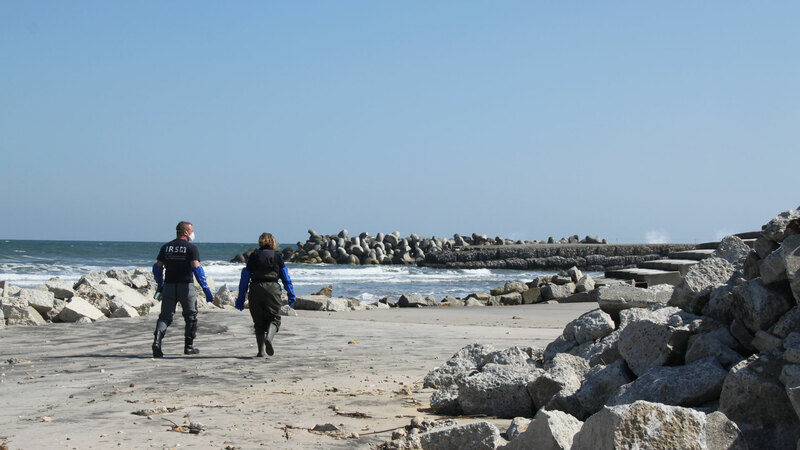 Read in Aktis n°11 "Modelling fish contamination"
​A team from IRSN Laboratory for Continental and Marine Radioecological Studies carries out sampling on the littoral north of the Fukushima-Daiichi site. © PRP-ENV/SESURE/LERCM/IRSN.